While only Westfront 1918 is set during the First World War, it and Kameradschaft are about the madness, futility and trauma of that conflict. 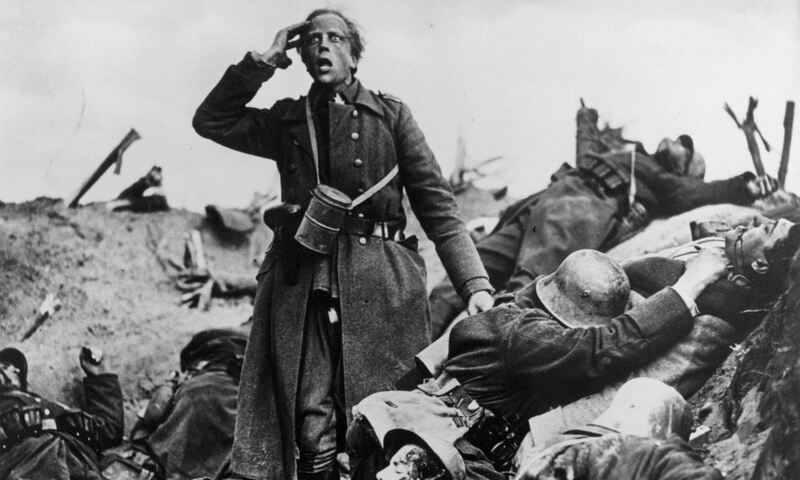 Set in the final months of the war, Westfront 1918 is Georg Wilhelm Pabst’s first sound film. Kameradschaft, released the following year, depicts a group of German miners rescuing their French counterparts from a tunnel collapse. Having previously shot Nosferatu, Spione, and Pabst’s own Diary of a Lost Girl, Westfront‘s cinematographer, Fritz Arno Wagner, works with Charles Métain to build a world of expressionist shadows, violent lines and unnatural angles. Physical space and visual order are inverted as a metaphor for the fever-dream madness of war. White hands protruding from the mud take on a sickeningly perverted sense of peace, whereas the living become like ghouls. In one stunning shot, a soldier maddened by the carnage takes on the momentary aspect of Death, recalling Wagner’s earlier work on Destiny. Though Westfront 1918‘s plot lacks the conventional pacing of the similar American production All Quiet on the Western Front, its narrative is thoroughly modernist as a breakdown of coherence and context. The politics and reasons for fighting are never mentioned, the characters both on the front and at home existing in a meaningless nightmare. The film’s explosive sound effects lack the punch that modern audiences have come to expect from war cinema, but rather than diminishing the effect, instead underscores a reality unanchored from sense. The second film in the collection, Kameradschaft, is not set during the war, but the psycho-spatial trauma that it examines most certainly derives from it. Based on a mining disaster in 1906 where German miners rescued their trapped French counterparts, Pabst resituates the story in the post-war tensions of 1931. The film’s opening shot pithily summarises French-German relations with two boys bickering over a game of marbles, poignantly foreshadowing the animosity between the miners. Where Westfront 1918 movingly depicts the madness of war, Kameradschaft works both as an examination of post-war trauma and as a grippingly paced thriller. The set design perfectly captures the sweaty claustrophobia of a mine, and glimpses of bodies half-buried by the rubble is just as harrowing as any of Westfront‘s imagery. Indeed, the disaster and subsequent rescue effort function as an inverted war metaphor. Shots of the German rescue party clad in rescue gear and gas masks consciously mirror the imagery of soldiers leaving for war, with the mine itself like an open wound on the border between France and Germany. Kameradschaft‘s conclusion avoids mawkishness in favour of poignant reflection on the relationship between capitalist exploitation, trauma and hatred. The miners’ bosses, keen to protect their profits are all too ready to re-establish the border that keeps their workforces divided and disempowered. It’s a poignancy heightened in retrospect, with the film’s final moments tinged with the dreadful irony of the imminent Nazi ascendancy and its attendant horrors.